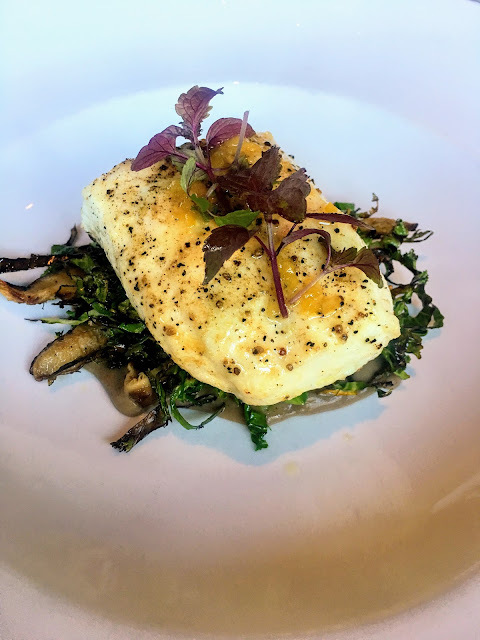 A moist, delicious Alaskan Halibut Fillet at the Saddle River Inn was prepared with kale, shiitakes, ginger and lemon ($35). 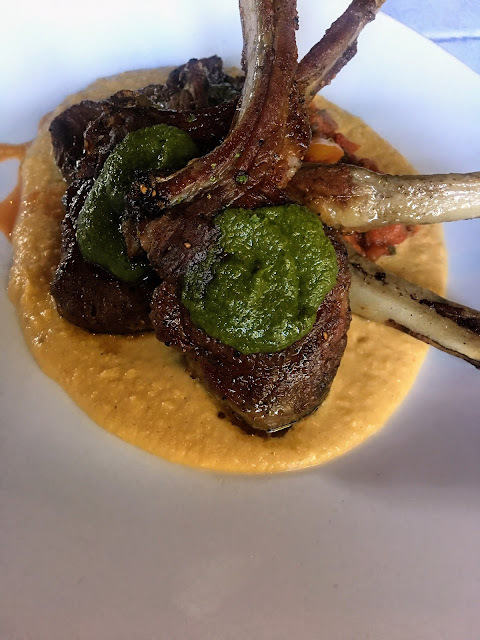 At a celebratory dinner, my wife chose a quartet of grass-fed Australian Lamb Chops with hummus, ratatouille and salsa verde ($45), and took two of them home. 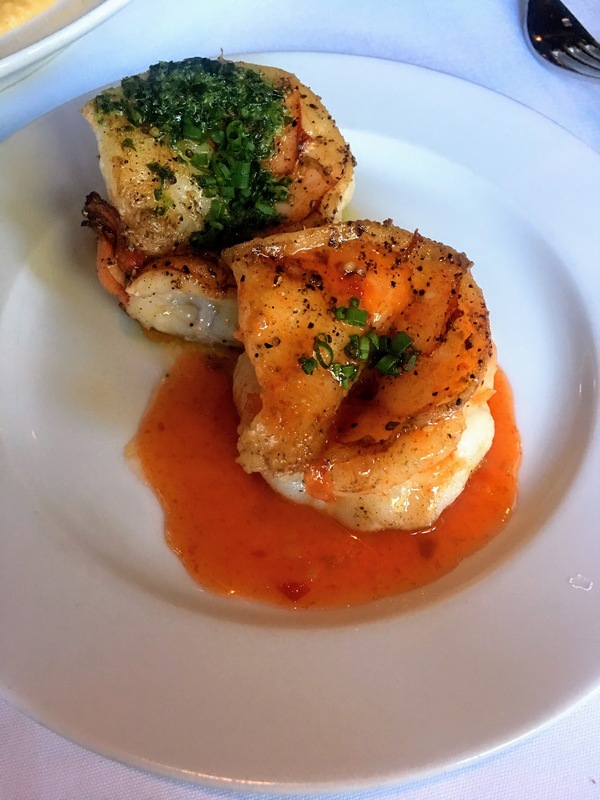 HACKENSACK, N.J. -- In Homer, Alaska, which calls itself the Halibut Fishing Capital of the World, restaurant cooks like to dip small pieces of this incredible fish into batter and deep fry them. Then, they throw some french fries on the plate, and charge $19.95 for the modest meal. At least, this method guarantees the strips of snowy halibut stay moist and juicy. 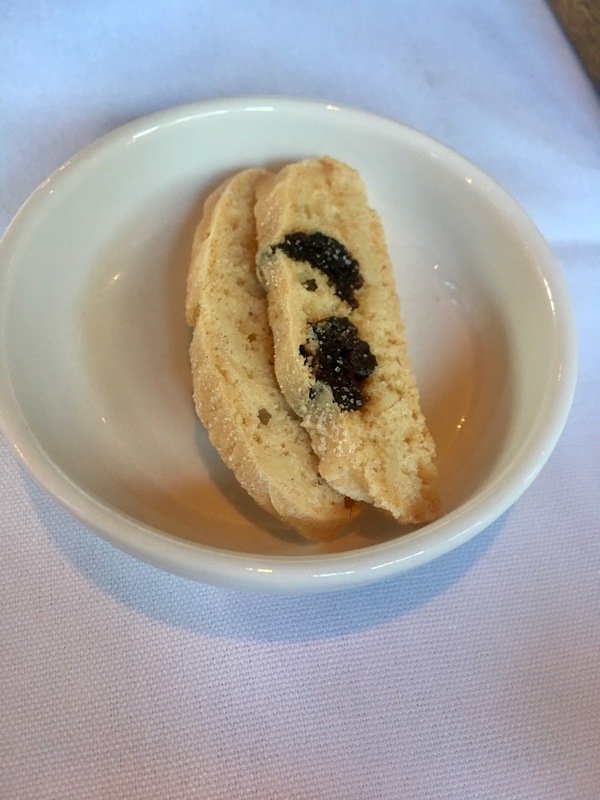 But at fine-dining restaurants in Alaska, a perfectly cooked fillet of wild-caught halibut isn't guaranteed, as we found out during a 15-day vacation in the 49th state this month. 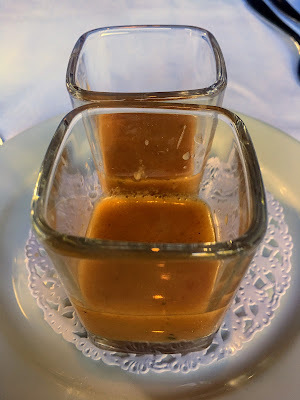 So, you can imagine my surprise and delight last week when I ordered Alaskan Halibut at the Saddle River Inn, a fine-dining restaurant just 11 or so miles from my home and 4,576 miles from Homer, and was told Chef/Owner Jamie Knott always cooks the fillet medium-rare. As someone who eats only seafood, that's just how I like my fish prepared. 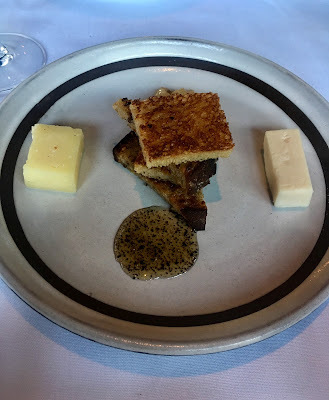 The menu said the halibut would be served with kale, shiitake mushrooms, ginger, lemon and soy-brown butter, so I just asked the kitchen to hold the butter. Delicious. The service and the rest of our meal on our first visit to the romantic BYO, where we were celebrating my wife's birthday, was nearly perfect. I toasted her with a bottle of Kirkland Signature French Champagne (Brut) from Costco Wholesale in Wayne. Our one real complaint: No one offered to take my straw hat, so I put it on the floor next to our table, along with my wife's handbag. 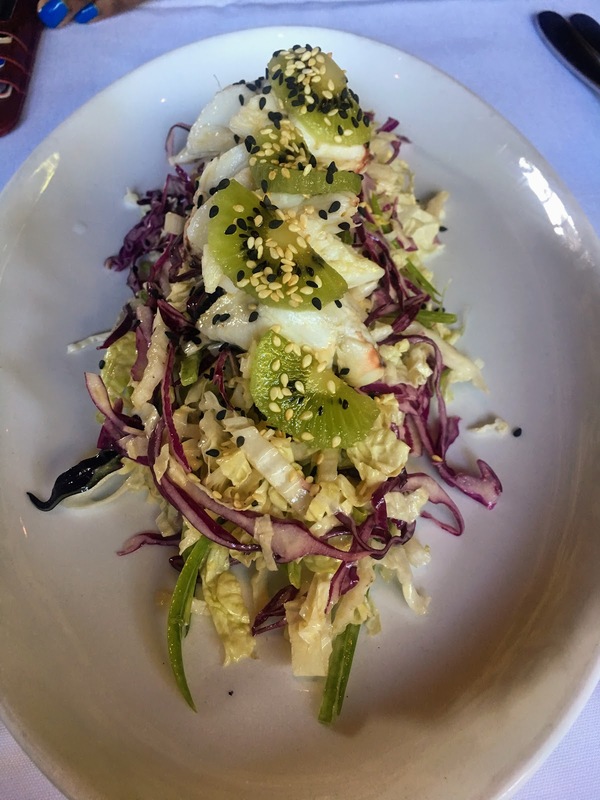 My wife started her meal with the Colossal Crabmeat Salad with Napa cabbage, snow peas, kiwi and sesame dressing ($18). 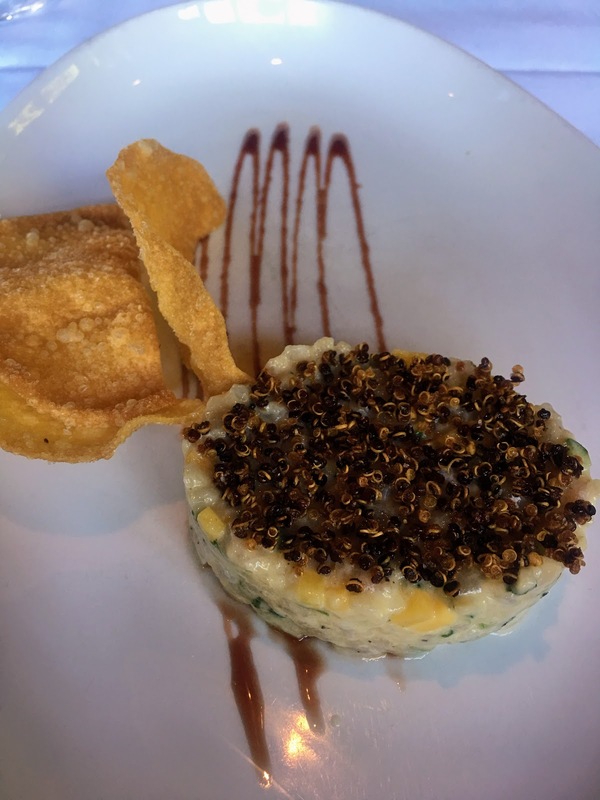 My appetizer special was called Hamachi ($19) -- diced raw Japanese amberjack or yellowtail with mango, crispy quinoa and wonton wafers. We were offered another special, colossal Wild Shrimp, for $7 each. We ordered two, and the one in the foreground, flavored with Thai Chili, was tender, but the other one was tough. Before our meal began, we received a gift of gazpacho from the kitchen. We ordered 2 hard cheeses for dessert ($10) -- Piave Vecchio from Italy and Manchego from Spain. Another gift, biscotti, were perfect, because we don't eat desserts like the chocolate and cheesecakes listed on the menu. A small pot of French Press Coffee ($5) provided two cups of strong coffee, some of the best I've ever had. DETAILS: The Saddle River Inn is at 2 Barnstable Court in Saddle River; 201-825-4016. Open for dinner only Tuesdays to Saturdays. BYO. Reservations strongly recommended. Website: New American Cuisine. There are also tables on a second level, along the sides of this former sawmill and basket-weaving factory that dates to 1840, but they are up a flight of stairs. New owners took over the fine-dining French restaurant in 2013.